There is a variety species of frog in the world called Poison Arrow. It is just around 4 centimeters long frog. These frogs are very beautiful. Now that smallest poison arrow frog has become the discussion of world. Why because major business is going on that frog among many countries in the world. So these frogs face the danger of extinction. It is not just the matter of extinction of one of the frog species. If these frogs are used in a proper way, they can be made useful in the manufacture of many medicines. Poison arrow frogs have poison all over their body. That’s why it is named so. Its poison is very powerful. One lakhth part of an ounce of its poison is enough to kill a person. Each frog has a total poisonous capacity of killing 2,200 persons. Its poison is that much powerful. There are 116 species of frogs in the Poison Arrow frogs. Only some species are poisonous. 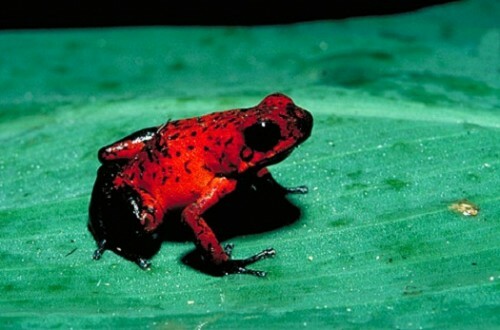 Poison Arrow frogs are seen mostly in the American forests. There is a strange reason for naming these frogs so. Hunters of the American forests know about the poisonous capacity of these frogs. They rub their arrows to the skin of these frogs to stick the poison to their arrows. Then they use those poisonous arrows for hunting. Hence these species of frogs are named as Poison Arrow frogs. Poison of these frogs has huge demand in the market as they are used in the manufacture of many types of medicines. Smugglers export the poison of the frogs to many countries illegally. At the same time, as these frogs are very much beautiful, people show interest to pet them. Poison Arrow frogs have a very special kind of life style. Male frogs make different types of sounds to attract the female ones. Some times male ones combat for the female frog. Female frog forms a pair with the male frog that wins the combat. Later female frog selects a good leaf and lays upto 40 eggs. After laying eggs, female one goes off irresponsibly. Now the male frog takes care of the eggs. It protects the eggs with extreme care. Till the eggs are hatched, male one carries them on its back and keeps them at a safe place with moisture availability like holes in the trunks of trees or in small water pits. Eggs grow gradually and form children. Child frogs thus born go away independently. Male frog protects them until the eggs are transformed to child ones. Life period of these frogs is ten years.